Some of Wayne State’s greatest success stories come from nontraditional students who, no matter their limitations or background, seize the opportunity to pursue their passion. One of those students is junior Shilian Duan, who exemplifies the vibrant mix of identities and ideas that makes Wayne State so unique. Duan, 27, is a student in the EACPHS’s clinical laboratory sciences program. Born and raised in China’s Sichuan province, she earned her master’s in pharmacognosy — the study of medicinal drugs obtained from plants or other natural sources — from Tianjin Medical University in July 2012. Shortly afterward, Duan’s husband was offered a graduate research assistantship in WSU’s Department of Pharmaceutical Sciences, a position he currently holds as he works toward his Ph.D. Just one month after Duan’s graduation, the two began planning a move to Detroit. 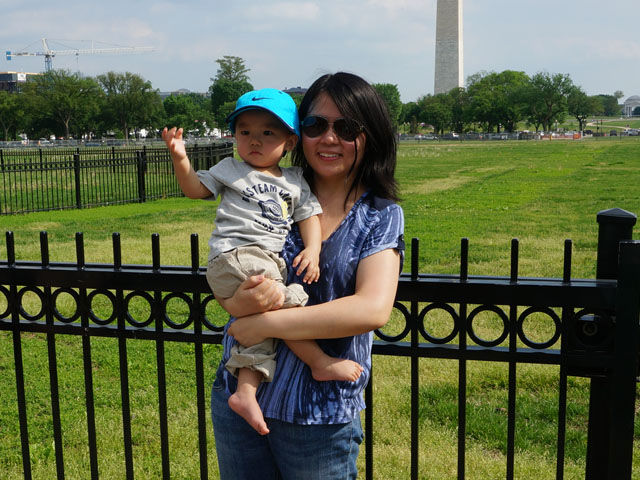 While her husband’s focus is pharmaceutical research, Duan has an affinity for clinical pharmacology, a passion she developed working at hospitals in China. She began researching clinical science programs in Southeast Michigan and found WSU offered an opportunity that, to her surprise, no other institution did. Qi, was born in February 2014. The couple is expecting their second child, a daughter, in December. “I don’t have much free time right now,” Duan explained — and it’s a bit of an understatement. In addition to taking classes, raising one child and preparing for another, she works 20 hours a week at a nearby toxicology lab, utilizing her experience to help finance tuition, rent and living expenses. But Duan received some financial relief this semester, as she was awarded the Clinical Laboratory Science Program Scholarship. With limited financial aid opportunities available to international students, the scholarship goes a long way in helping Duan earn her degree. As for her experience at Wayne State as an international student, she explains it’s been an enlightening challenge. Duan lives in an apartment with her family just off campus. She admits the prospect of living and learning in Detroit as a newcomer to the United States was unnerving, but many of her fears have been dispelled. In fact, Duan hopes to stay in Detroit and work in a hospital after completing her degree, despite the often long and complicated immigration process for international students. Even her perception of the American college student has shifted thanks to her experiences at Wayne State, admitting that the “all party, no work” students she expected to encounter don’t really exist. As a student facing her own set of challenges in pursuit of a degree, it’s a mentality that’s earned her respect. Duan has spent most of her life in school. Only a month removed from a master’s program in China, she moved across the world to a new city, started a new family and received a new education — both culturally and academically. Shilian Duan is far from an average student. She’s a reminder to seize every opportunity in the pursuit of knowledge. And she represents a nontraditional path to a university that embraces the uncommon.